Data Analytics and Machine Learning Fundamentals [Update] | Free eBooks Download - EBOOKEE! Nearly every company in the world is evaluating its digital strategy and looking for ways to capitalize on the promise of digitization. Big data analytics and machine learning are central to this strategy. Understanding the fundamentals of data processing and artificial intelligence is becoming required knowledge for executives, digital architects, IT administrators, and operational telecom (OT) professionals in nearly every industry. 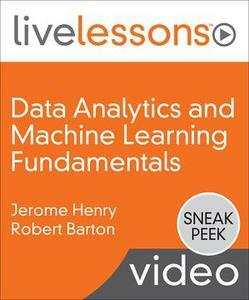 In Data Analytics and Machine Learning Fundamentals LiveLessons, experienced CCIEs Robert Barton and Jerome Henry provide more than 7 1/2 hours of personal instruction exploring the principles of big data analytics, supervised learning, unsupervised learning, and neural networks. In addition to delving into the fundamental concepts, Barton and Henry address sample big data and machine learning use cases in different industries and present demos featuring the most common tools (such as Hadoop, TensorFlow, Matlab/Octave, R, and Python) in various fields used by data scientists and researchers. At the conclusion of this video course, you will be armed with knowledge and application skills required to become proficient in articulating big data analytics and machine learning principles and possibilities. No comments for "Data Analytics and Machine Learning Fundamentals [Update]".